The Giada F200 provides a complete thin client solution device that helps reduce operating costs and power consumption, with a longer life cycle. 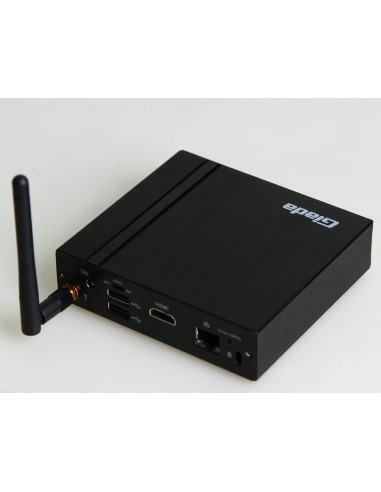 Indeed, due to all the user-oriented and easy-to-deploy features, the Giada F200 is great for applications in thin client systems as well as virtual terminals, digital signage and industry control computers. By implementing key features in the F200, Giada's latest Mini-PC is ready for deployment in a variety of environments. For example, the robust & durable all-metal chassis design allows for any sort of industrial placement. Compared with a plastic design, the metal chassis provides better protection for the internal parts from damage as well as EMI (Electro Magnetic Interference). Thanks to the Nanoscale sand blasting process, the anti-corrosive and stain-resistant performance of the chassis surface is greatly enhanced. In addition, the all-metal design can improve the heat dissipation efficiency and lowering the working temperature of the parts, thus to prolong the form factor's lifetime. Another requirement of industrial applications is the ultra-compact form factor. Measuring only 116.6 x 107.2 x 30 mm, the F200 takes only 1/30 the volume of a traditional PC and enables flexible deployment and installation. It frees up precious space and can be seamlessly mounted behind the monitor or hidden in any obscure corner inside a digital signage device. And with the modularized design, it is easy to disassemble the IO backplane and implement a quick installation of memory, SSDs, Wi-Fi, BlueTooth or 3G modules. Speaking of memory, the F200 provides 2GB onboard memory and eMMC storage, so there is no need for the users to install additional memory separately, thus avoiding possible quality problems caused by poor contact of memory modules as well as seismic or vibration issues. The Giada F200 is noise-free and dust-free. Noise and dust pollution are efficiently thwarted by adopting an advanced fanless design. In return, the dust-proof working environment enables better stability and reliability during its operation. Powered by Intel Celeron N2807 processor, the F200 consumes only 5W of the power even in full load. Lower power consumption means less heat dissipation at the same time, which also prolongs the life cycle of the F200. To reach as many users as possible and meet their various OS demands, the F200 is specially designed to support both Windows & Android. For Windows OS, the F200 is compatible with Windows 7, Windows 8.1 and Windows 10.